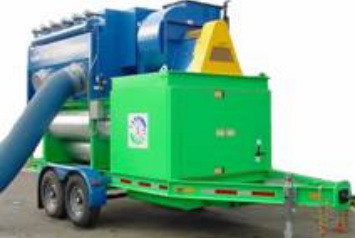 A compact and versatile dust collector, the SAFE Systems DC14,000D is powered by a belt-driven 50 HP Diesel engine and carries 100 gallons of fuel onboard. The unit has two (2) 18” diameter dust inlets on each of two sides to give the user greater versatility. Only two (2) inlets are to be used at a time. The dust collector utilizes eighteen (18) filter cartridges which are cleaned by an automatic pulsing system. The dust falls into the hopper where an auger system makes it easy to remove it into a standard 55 gallon drum.